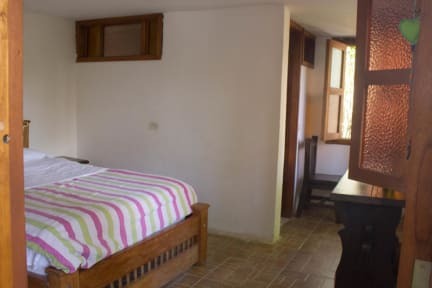 The original Plantation House (PH 1) is a 100 year old coffee plantation house that offers small dormitory and private accommodation with and without ensuite bathrooms, lounge and kitchen facilities. Plantation House Two (PH 2) is a renovated traditional style farmhouse set in 2 acres of land and is literally across the road from the original Plantation House. In both the Plantation Houses new kitchen and social areas with fireplaces have been constructed. Salento is an Andean town in Colombia, west of Bogotá. It’s known for its coffee estates. The Plantation Houses have extensive gardens, with a myriad of flowers and native trees and of course a few coffee plants. This also offers both small dormitory and private accommodation with and without ensuite bathrooms. Both Plantation Houses have gas fired hot water systems. Amongst the many services we offer our guests are WIFI, free internet, kitchen facilities, free coffee, book exchanges and book shop PLUS the best most current and accurate tourist information in Salento. There is no availability for The Plantation House Too on your selected dates. We stayed 3 nights at the plantation house. The hosts were very friendly. We stayed in a private room, with bathroom ensuite. It was clean and nice decorated. 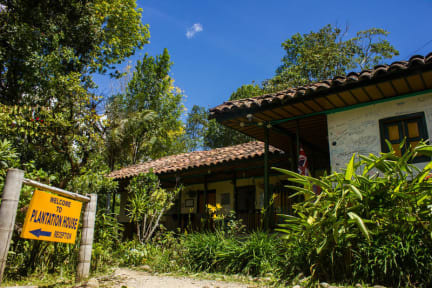 It is an old coffee farm, and I would highly recommend the coffee tour of Don Eduardo. Tip: while you're there, do the salento cycling tour. In an overall it is a really good hostel. Amazing location, plenty bathrooms, great kitchen and very helpful staff. Nice and cosy hostel adjacent to its own finca. Good atmosphere and helpful staff. Recommended. Great place to stay. Friendly, comfortable, good value and only a short walk to the town centre. And the coffee tour from there is excellent. Only stay if you like dogs though! Our stay at plantation house was very nice. We really enjoyed being away from the center, feeling in the middle of nature, but so close walking to the main square with restaurants and bars. The beds were very comfy with blankets since it can get chilly at night. I did the coffee tour with Tim which I really enjoyed. I learned a lot. And the owners even gave us a ride to the bus station on our last day! The dogs and cats who stay there are lovely. Thank you wonderful stay. Great for couple! I enjoyed my stay at Plantation House and would also recommend their coffee tour (be sure to ask about the discount if you do stay here). The hotel is a short walk from the Salento bus terminal, and check-in was quick and easy. There was hot water, a shared kitchen and was peaceful at night. Would stay there again. Lovely little hostel in Salento. An old coffee plantation so has a real nice feel to it. Walking distance to the town square. Staff are really friendly and helpful.